Nvidia's partners have wasted no time in presenting latest-generation RTX GPUs in myriad shapes and sizes. A quick trip to the virtual shelves of Scan Computers reveals over a dozen RTX 2080s to choose from, with prices starting from an eye-watering £725 and rising to a pant-wetting £999. 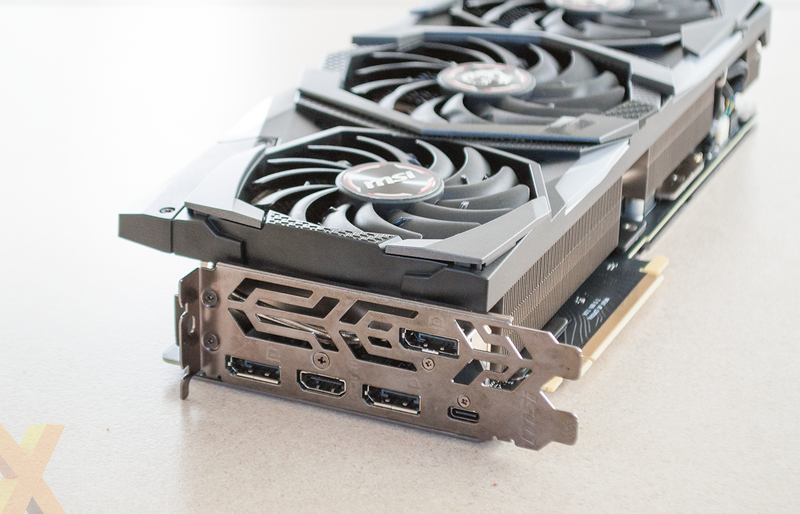 We've already had the opportunity to examine high-end cards from EVGA, Gigabyte and Palit, and though all have proven capable, they each struggled to stand out in the face of Nvidia's new-and-improved Founders Edition. 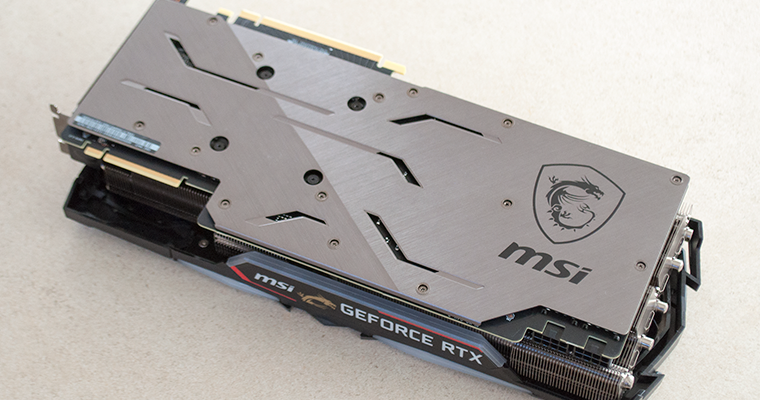 Today we turn our attention to MSI, whose catalogue of seven air-cooled RTX 2080 SKUs is topped by the Gaming X Trio. 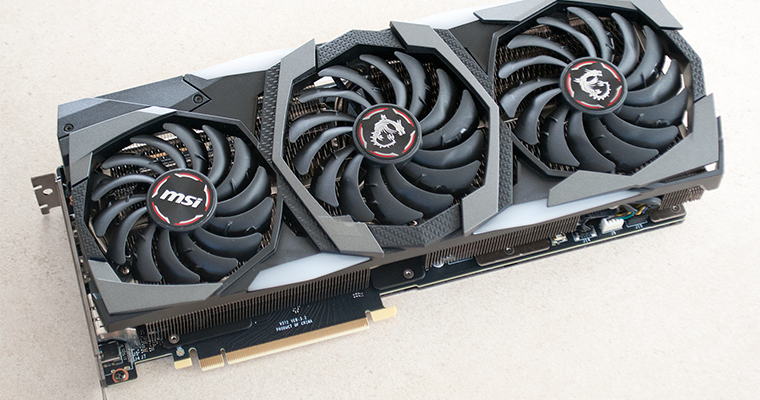 Prior experiences of Gaming X Trio hardware have revealed big-and-bold hardware, and the RTX 2080 iteration is no exception. 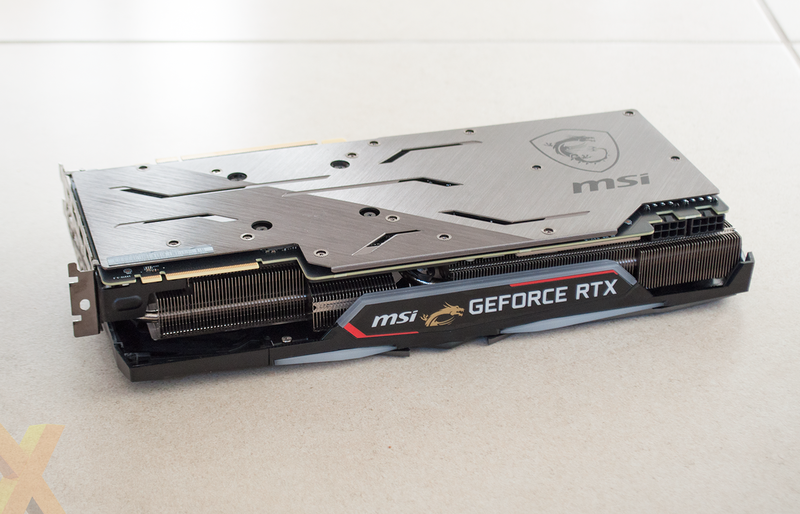 Measuring a whopping 327mm x 140mm x 56mm in size, MSI's board is easily the largest RTX 2080 we've handled, and it's heavier than most, too, weighing in at 1,540g. 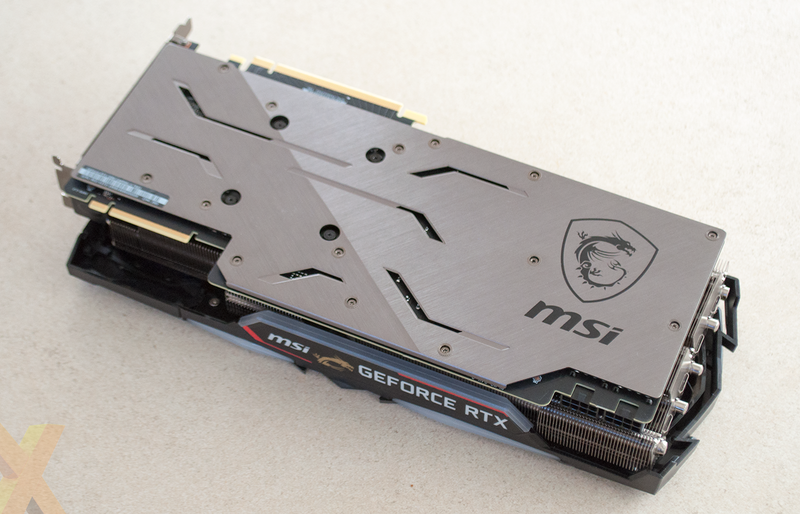 MSI has used the massive dimensions to create a card that looks formidable, though the gargantuan profile does mean that you should choose a chassis accordingly. The primary black and grey colour scheme works well, while the few red highlights won't spoil a themed build, and if you're partial to some RGB LEDs, MSI's implementation is rather good. Transparent sections flanking the central fan offer good illumination, as do the MSI badge and dragon logo across the top edge. It's a shame the GeForce RTX lettering isn't also backlit, yet even so, this is one of the more attractive RGB setups we've seen, and the effects can of course be synchronised with other MSI hardware using the firm's Mystic Light software utility. Construction quality is very good throughout, and nowhere more so than the rigid metal plate lining the back of the custom PCB. 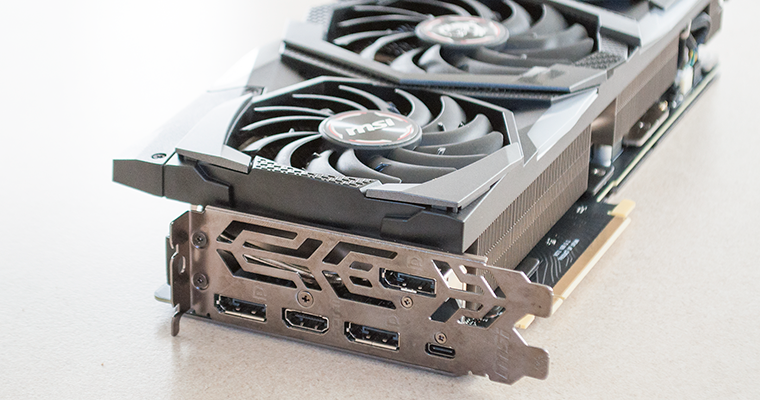 Despite the substantial size and weight, we were presently surprised to find that the card didn't sag when installed inside our test platform. There's always a chance droop will develop over time, but if it does, a metal support bracket is included in the box; attaching it to the next two expansion slots provides the graphics card a place to rest. Given the three-slot form factor, there's obviously a serious amount of cooling paraphernalia lying within. MSI's in-house PCB, which promises improved power delivery, is outfitted with a die-cast metal sheet that acts as a heatsink for the memory modules. Sat atop of that is a full-size stack of aluminium fins, interspersed with six nickel-plated copper heatpipes, and then a trio of Torx 3.0 fans. All three switch off at low load, two spin into action when core temperature exceeds 56ºC, and the third comes to life when temperature pushes beyond 60ºC. Such a meaty design and an upgraded 8+8 power input intimates a hefty factory overclock, but that surprisingly isn't the case. MSI's out-the-box boost clock is rated at 1,860MHz - 60MHz more than reference - and the 11GB GDDR6 frame buffer is kept to a standard 14Gbps. 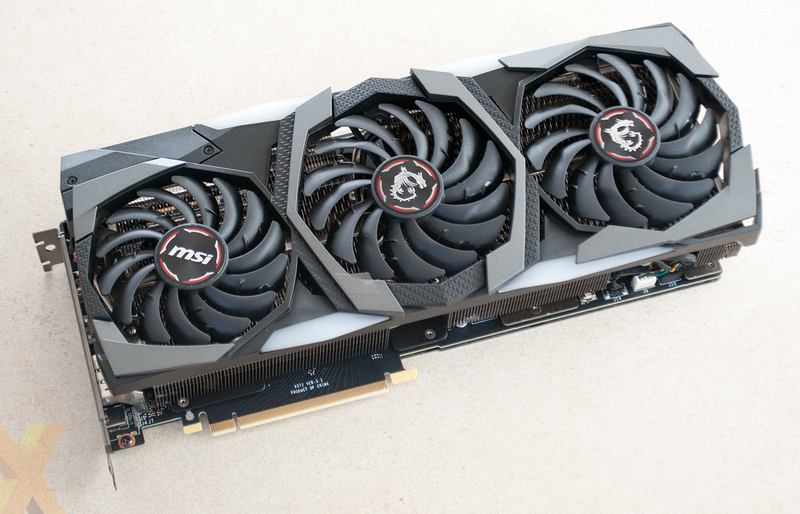 Hardly slow, but having seen Palit do 1,875MHz, we'd expected a little more from MSI's Gaming X Trio. Those who plan on implementing their own overclock may also be disappointed to learn that there isn't a dual BIOS. Elsewhere, and as expected, the selection of display outputs remains unchanged, with the silver I/O plate offering the default configuration of three DisplayPort 1.4, one HDMI 2.0b and USB Type-C. The Gaming X Trio is ultimately a robust and factory overclocked solution that's bound to run cool and quiet, but pricing remains a sticking point. 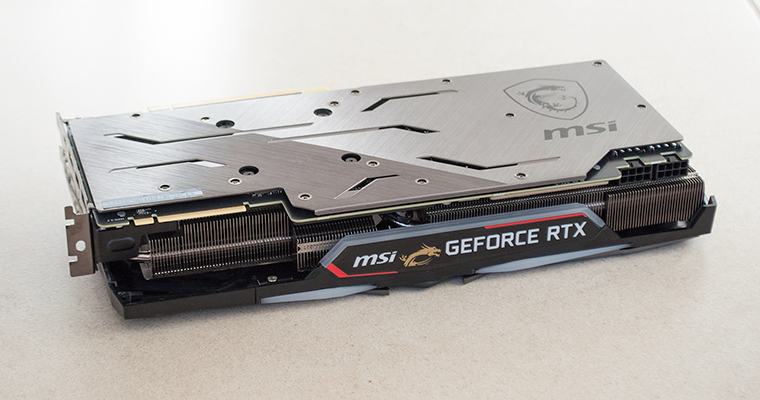 Current UK listings put the card at £815, and though the huge cooler is impressive, the near-10-per-cent premium over the new-and-improved Founders Edition isn't easily justified. And let's not forget, if you're hoping to save a few bob, the previous-generation GTX 1080 Ti remains a potent solution and is now available for under £600. There's an argument to be made for picking up a GTX 1080 Ti and using the savings to invest in a handful of games, but if you're more inclined to invest in Nvidia's forward-looking Turing architecture, head on over to the next page to begin some benchmarking action.